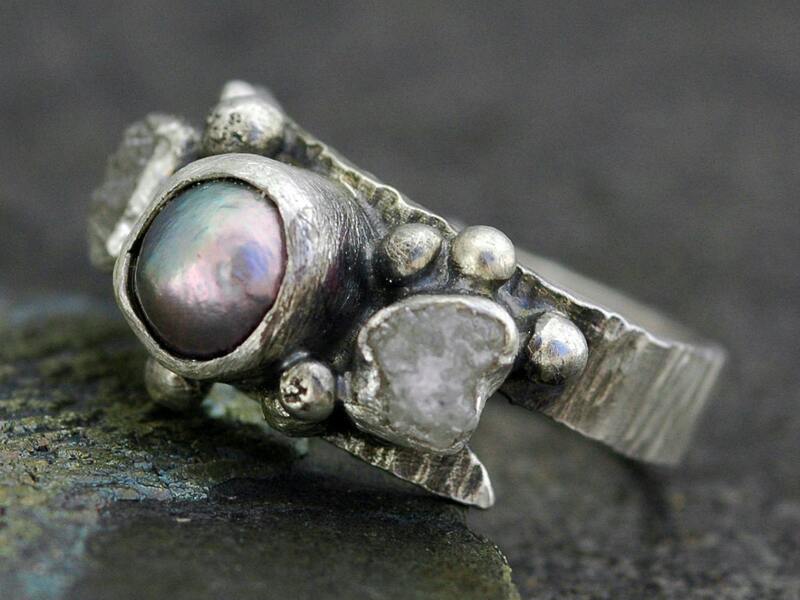 PLEASE NOTE: The exact rings pictured in this listing have been sold. The photos are used to give you an idea of how your custom-made ring will appear once built. 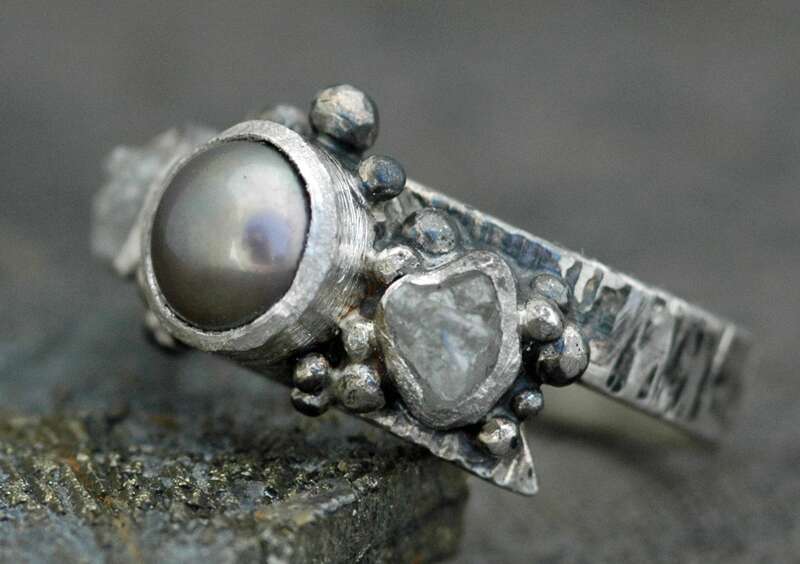 The focal point of the ring is a luscious, steel-coloured pearl. Although these pearls all come from the same parcel, some are lighter, and some are darker. If you have a preference, please let me know during checkout. 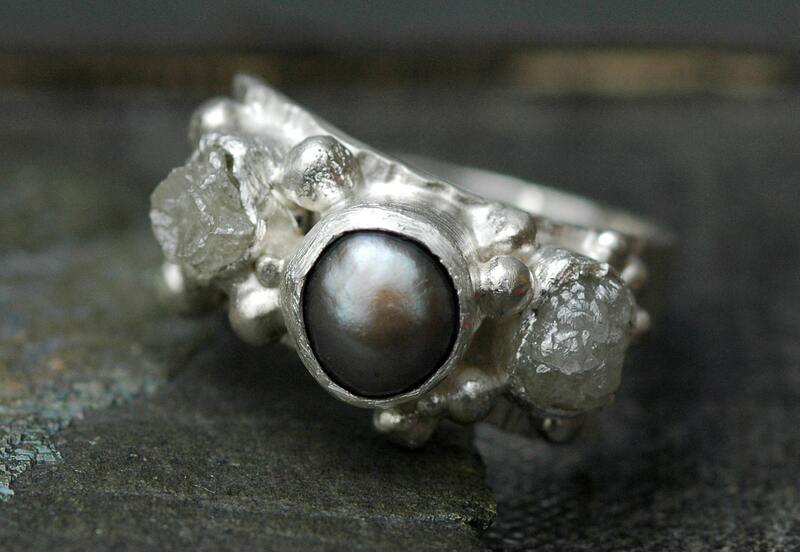 I have bookended the pearl with two gorgeous, glossy raw diamond crystals. Both perfectly compliment the iridescent gloss of the pearl. The sterling silver ring band is in a double-tipped formation. I gave it a dramatic, linear texture with my hammer, and then polished it with a steel brush. 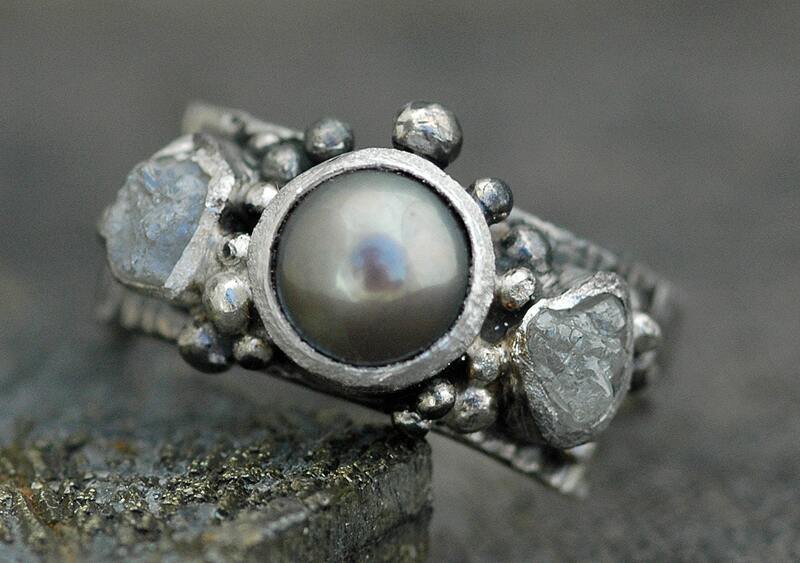 The diamonds and pearl, including the bezel, measure about 13mm across. The ring band is 4mm across. The diamonds I am using for these rings measure around the 3.5-4mm mark, so smaller than the pearl, which is around 6-7mm across. All edges have been sanded for comfort, and the inside of the band was given a high shine polish. Some of the rings shown have had the granulation (little silver balls) oxidized and then buffed, leaving a dark accent around them. If you would like me to oxidize your details, please let me know. The above link will take you to a listing that has the same ring, without the diamonds. NOTE ON COLOUR: Some of my pearls are lighter, and some are darker. The same goes for my raw diamonds. If you have a colour/tone preference, please let me know. Otherwise, I will pick the loveliest of the bunch for your ring. Other colours are available for this design, including peach, lavender gray, chartreuse green, white, and dark purple-gray. Let me know if you would like a different colour.